We are going next week to Argentina, to the 26º Congress of Argentinean Society of Intensive Care. In September, Carmen Segovia and José Carlos Igeño will go to Quito (Ecuador), to participate in the “II International Course of Evaluation and Management of the Critically ill patient”. This course will be held from September 1st to 4th and has been organized by the ICU team of Hospital Luis Gabriel Dávila, leaded by Dr. Santiago Párraga. 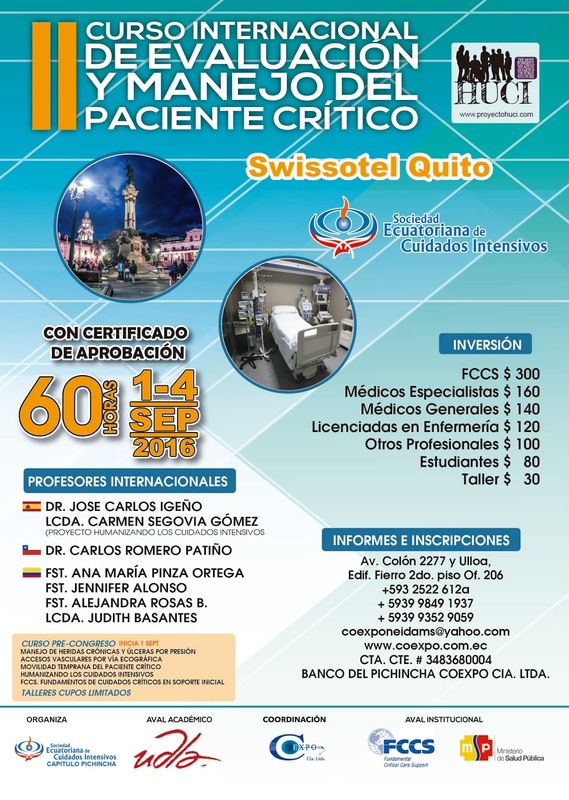 This amazing experience will have the participation of renowned national and international speakers national and the endorsement of the Ministry of Public Health, the University of las Americas, and the Ecuadorian Society of Intensive Care; with an academic program focused on current issues and of great interest in multidisciplinary and inclusive management of the patient, with the participation of the family, enhancing quality and humanized intensive care. This is the program (only available in Spanish), where “the H” has a clear prominence: satisfaction, open ICU doors, the Humanization ICU Plan, counselling, grief, breaking bad news, end of life care and the process of dying. For us is an honor and pride to light the flame that #humaniza to our ecuadorian mates.